A sausage isn't a sausage without a little sauerkraut, but for some people, the flavor can be a little strong in large doses. To turn this fermented vegetable from a garnish into a meal, you'll need to cook it. Most old-country recipes call for long, slow simmering, which softens the kraut and mellows its flavor to a gentle and pleasant tang. Whether it's homemade or already packaged in a can, jar, or plastic vacuum-pack, sauerkraut is almost always preserved in a natural pickling brine, a vinegar solution, or even white wine. Some recipes call for cooking the kraut in this liquid, while others say to drain and rinse. There's no hard and fast rule, so feel free to taste the liquid and see if you're into it. If so, set it aside to use; if you can't handle the flavor, skip it. When in doubt, rinse it out. Start cooking by sautéing some onions in olive oil, then add the sauerkraut. Add roughly 2/3 to 3/4 cup of liquid per pound of sauerkraut; it can be the liquid it came in, water, broth, beer, white wine, apple juice—whatever you like. Let it simmer for an hour or so until it softens. 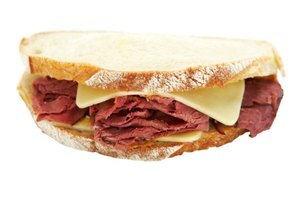 Naturally sweet or rich ingredients pair well with sauerkraut's tang, so many recipes go beyond the basic steps above. In the Midwest, for example, onions and kielbasa or bratwurst might go into the pot with the kraut for a classic sauerkraut and sausage dinner. In Europe, where it's been a staple for centuries, more lavish versions are common. Germany's weinkraut and France's choucroute garnie—which basically translates to "loaded sauerkraut"—turn the simple cabbage into a showstopping main dish. Replicate these classic dishes at home in a large slow cooker or Dutch oven, or make big batches in a turkey roaster. The basic process is similar, but there are more ingredients and longer cook times. Here's how. Sauté onions in an oven-safe pot. 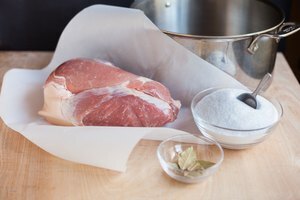 Add a piece of cured pork -- slab bacon, smoked hocks, or the shank end of a ham are all good choices. Feeling ambitious? Throw in a piece of fresh pork shoulder or leg, too. Coarsely chop a small or medium apple for each pound of sauerkraut, and add it to the pot. 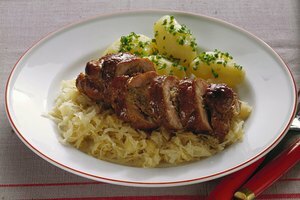 Cover the pork with well-drained sauerkraut, then add enough apple juice or white wine to cover the meats. Flavor the mixture with bay leaves and fresh-ground pepper. European recipes often call for caraway seeds or juniper berries, as well. After the pot has simmered in your oven or on your stovetop for an hour or two, add fresh or cured sausages. Simmer for at least another hour so the sausage flavors are thoroughly infused into the dish. 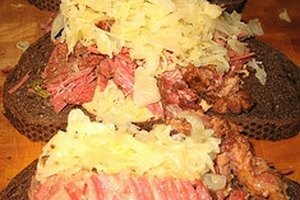 Once the sauerkraut has mellowed and the meats are fork-tender, it's ready to serve. 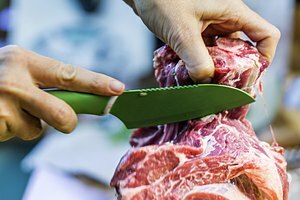 Remove the meats and slice or shred them. Fill a serving tray or large bowl with the kraut, arrange the meats on top, and serve with a bowl of boiled or mashed potatoes. For a deluxe version, simmer heavy cream in a separate pan with schnapps or spices until it's reduced to half its original volume. Just before serving, after the meats have been removed, stir the rich cream mixture into the sauerkraut.